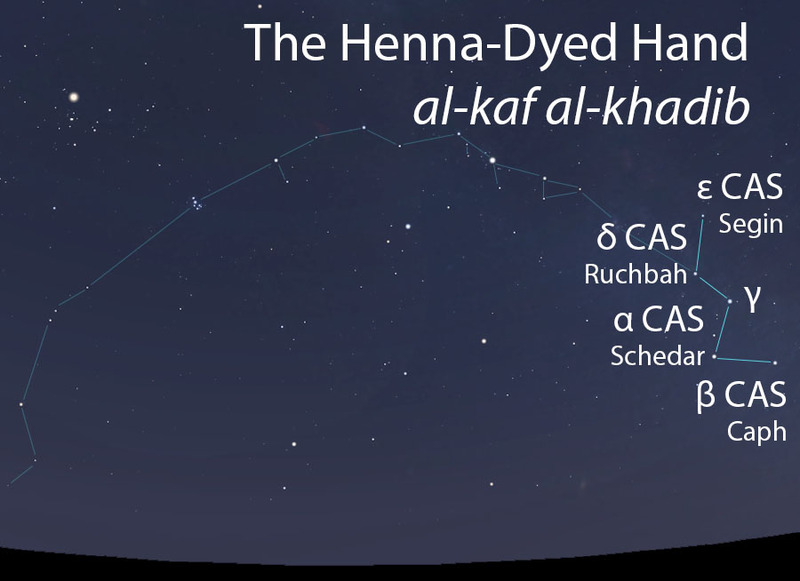 The Henna-Dyed Hand is one of two hands of Thuraya, a brilliant star cluster that was anthropomorphized as a female figure. The Henna-Dyed Hand is longer than the Amputated Hand (al-kaf al-jadhma’) and features several well-defined elements. Henna, a natural dye that is green when prepared, leaves an orange stain when applied to hair or skin. Women to this day apply henna to their hands during celebrations, such as weddings, and this is reflected in the yellow-orange color of the bright star that lies near the end of the stellar Hand. The Henna-Dyed Hand (al-kaf al-khadib) as it appears in the west about 45 minutes before sunrise in early November. Sky simulations made with Stellarium. A bright group of five stars arranged in the shape of a “W”. 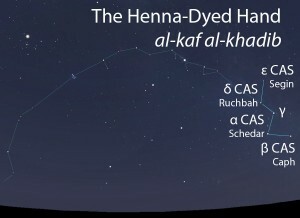 The Henna-Dyed Hand includes the five primary stars of the modern constellation of Cassiopeia, but the name also referred to the final star alone (Caph). The Henna-Dyed Hand does not figure among the rain stars. The Henna-Dyed Hand is not one of the lunar stations. The Henna-Dyed Hand is part of the Hands of Thuraya (aydi ath-thuraya, أيدي الثريا) folkloric celestial complex. The Henna-Dyed Hand connects through Thuraya itself (ath-thuraya, الثريا) to the Amputated Hand (al-kaf al-jadhma’, الكف الجذماء).